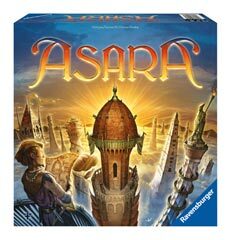 Ravensburger 26532 - As wealthy builders, players seek to increase their prestige by constructing the highest, grandest and largest number of towers over the course of 4 rounds. Building blocks and different sections of tower (base / trunk / window / turret) are purchased from each area of the market. Pit your skills against your rivals and win! Rules for advanced version included! Playing time 30-60 minutes for 2-4 players.